Continuing its mission to provide veterans and their spouses with the finest choices for post-secondary education, VIQTORY has released the 2019-2020 Military Friendly​® ​Schools list. Now in its ​10​th ​year​, the​ Military Friendly®​ Schools list has come to set the standard for higher education institutions to provide the best opportunities for veterans and their spouses. This prestigious list provides a comprehensive guide for veterans and their families using data sources from federal agencies and proprietary survey information from participating organizations. 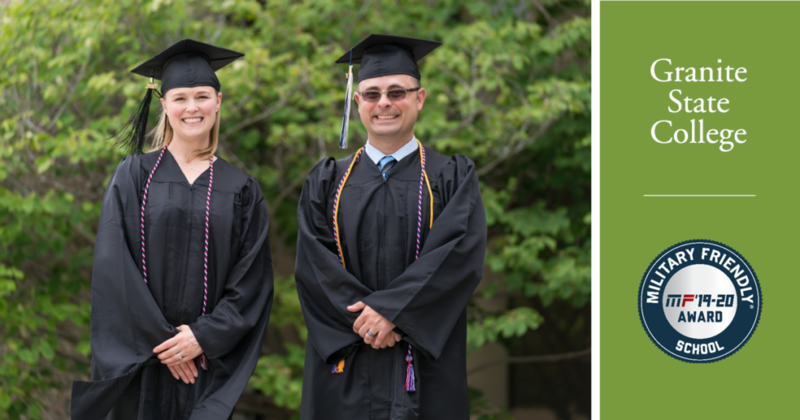 With nearly 15% of the student body comprised of servicemembers and veterans, Granite State College is dedicated to helping military and veteran students get ahead in their careers. With college credit for military training, career-focused degrees and programs, flexible online courses, and an Active Duty Tuition Discount that can provide savings for bachelor’s and master’s degrees, servicemembers’ lifestyle, priorities, and experiences align with the core values and opportunities at Granite State College. The Military Friendly®​ Schools list is created each year based on extensive research using public data sources for more than 8,800 schools nationwide, input from student veterans, and responses to the proprietary, data-driven Military Friendly® Schools survey from participating institutions. Founded in 2001, VIQTORY is a service-disabled, veteran-owned small business (SDVOSB) that connects the military community to civilian employment, educational and entrepreneurial opportunities through its G.I. Jobs®, Military Spouse, and Military Friendly® brands. VIQTORY and its brands are not a part of or endorsed by the U.S. Department of Defense or any federal government entity. Learn more about VIQTORY at www.viqtory.com​.